BODENEHR - Prospect von S. Petersburg und der Insul Retufari. BODENEHR, G. - Prospect von S. Petersburg und der Insul Retufari. Prospect von S. Petersburg und der Insul Retufari. - BODENEHR, G.
Title : Prospect von S. Petersburg und der Insul Retufari..
Map maker : BODENEHR, G.. Size : 5.1 x 10.6 inches. / 13.0 x 27.0 cm. 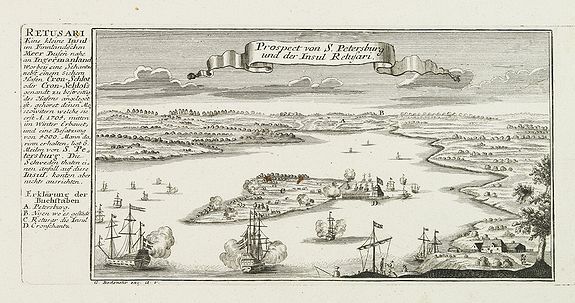 Description :Bird's-eye view of the island Retufari, with according to the key the town of Saint Petersburg (A) in background. With a description in German to the left. Condition : Good margins, dark impression. With two small brown rust spots in center of print.